1 of 3 Heat oven to 425 degrees. 2 of 3 Halve potatoes and toss in a large bowl with olive oil, salt and pepper. 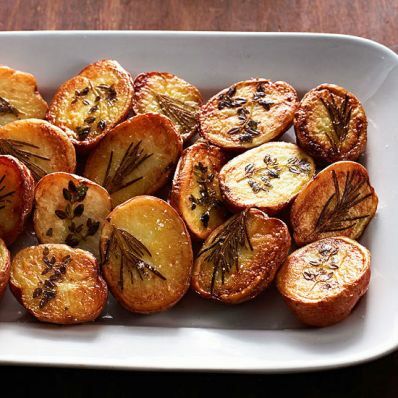 Pluck a piece of rosemary or thyme smaller than the width of the potato and press onto the cut side. Place cut-side down on a large, light-colored, heavy-bottomed baking pan about 1 inch apart. 3 of 3 Roast at 425 degrees for 35 minutes, or until potatoes are fork-tender and cut side is browned.